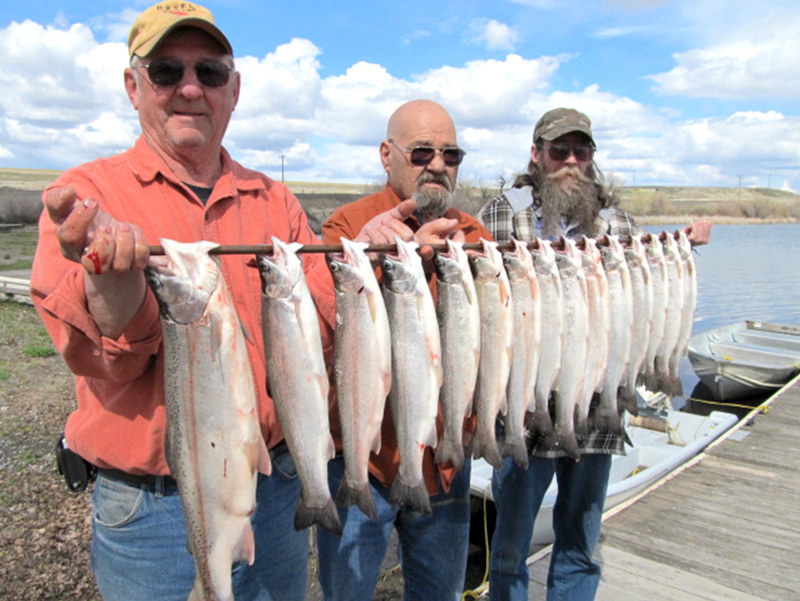 A big rainbow, left, and 14 steelhead made up the April 8 catch of these three Sprague Lake anglers. The one-time bounty of steelhead stocked in Sprague Lake last year is catching on with anglers. “They’re doing really well and are certainly contributing to the fishery,” said Randall Osborne, Washington Department of Fish and Wildlife fisheries biologist. Sprague Lake is a year-round fishery for trout, largemouth bass and channel catfish. The massive infusion of fish, in addition to the normal plant of hatchery rainbows, is the result of a lawsuit filed by wild steelhead advocates that prevented department managers from releasing young ocean-going rainbows last spring in Puget Sound streams. Rather than waste the fish, about 369,000 small steelhead were stocked in Sprague. While many of those fish were consumed by Sprague Lake’s bass and channel catfish, the survivors have prospered. Another 340,000 steelhead originally raised at hatcheries to be released in Puget Sound streams were stocked in 47 Western Washington trout lakes this month. The steelhead, which can be identified by a clipped adipose fin, are healthy and running about 15-16 inches, Osborne said. The hatchery-raised rainbows stocked in Sprague Lake – about 125,000 in the course of a year – are not fin clipped. Sprague is the only Eastern Washington lake to get a boost from surplus steelhead. Scott Haugen of Four Seasons Campground on Sprague Lake said anglers are thrilled. Sprague Lake was treated with rotenone in 2007 to kill the mix fish species that was resulting in stunted fish. It was restocked with trout, bluegill, largemouth bass and channel catfish. “I’m surprised more people aren’t fishing for the catfish,” he said. “They put about 3,000 of them in the lake in 2008, plus about 50 of the 14- to 15-pounders they salvaged from the lake before the treatment.